Happy Saturday friends. Today I thought I would link up with Farley from Oh’ Boy 4th Grade. I love her monthly link-ups. Listening– It’s Saturday morning and that is what is on our TV at the moment. Loving– Today is the last of my lazy Saturday mornings until June. Yep, that’s right you read that right June. Baseball season begins next week. Don’t get me wrong I love watching my son play baseball, but it is a long season and I adore lazy mornings with my coffee. After coffee, I like to go to farmer’s market and get some fresh fruit and veggies for the week. I will cherish today. Thinking– I plan out a menu for the week, which helps when I grocery shop. The menu is always subject to change, but it sure makes my life easier during the week. Wanting– Summer! I don’t thing I need to explain the reasoning for this. 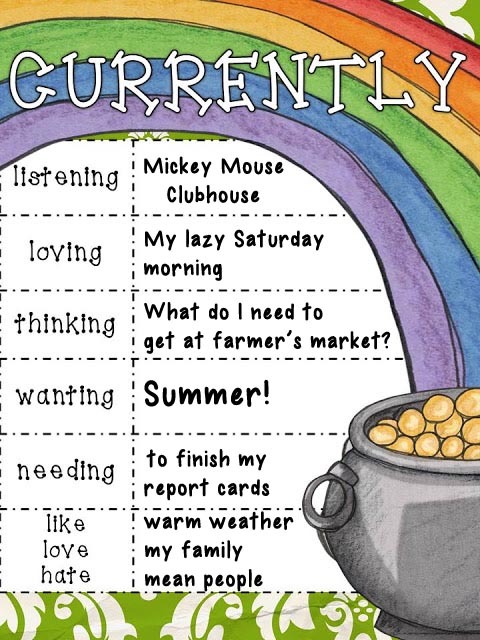 Needing– We have a report card prep day next Friday (no kids), but I like to have them done before that. My plan is to finish them up this weekend. Like– We have had gorgeous weather here lately and I would like it to continue. Love– My husband and son are great. We have a lot of fun together. Hate– Mean people are just not pleasant. I want to “fill their buckets” because I feel they must be empty or close to it. And for those of you who read my blog, you probably have learned that I enjoy sports. With March Madness around the corner, I thought I would make a mini-math pack. Here you go, it free! Are you a March Madness fan? Hi..I found you through Farley! I so get you about Saturday mornings…and coffee. I really enjoy that time, too. Our weather is warming up also and turning out beautiful…can we just keep it please? 🙂 Have a Saturday! I found your blog through Farley! Your March mini basetball pack looks awesome! I am glad I found it! What a great freebie. Thanks for sharing! I live near UNC and Duke, so pretty much everyone around here is a huge basketball fan. My kids will love the basketball theme! Just checking in with my CA bloggy friends! Hi there! I'm a fellow California blogger here on the central coast. I've started following your blog! Hi fellow California 1st grade blogger! I teacher 1st grade near San Diego. I'm your newest follower.